After our busy week in New York, the fun did not end because Nathan and I went to a Michal Bublé concert Friday night. Back in November, Nathan joined his fan club so we could get priority tickets. Nathan bought us floor seats and they were so worth it. Michal Bublé is our favorite artist, he sings our song "Home," so we were more than happy to splurge a little on the seats. 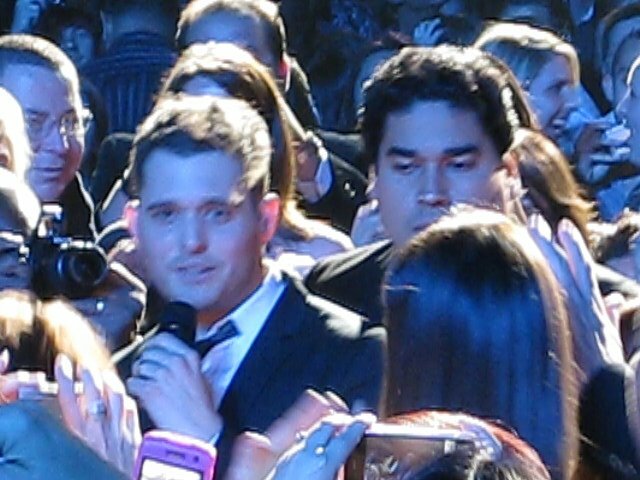 Michal Bublé is such a great entertainer. He is crude, rude and so not PC. He loves his fans and said " I don't want this to be a concert. I want it to be a party." At one point he came down into the audience and walked right past our row and got up on a stage a few seats behind ours. From there he sang "Home." When we walked back to the stage he was seriously like five feet away. If I reached my hand out I could have touched him (I sound like some uber fan...oh yeah, I am). We had a great time, laughing, singing and taking lots of pictures. The shot from when I went backstage...j/k I took this of the huge screen behind him. When he walked right past us. OMG...he is looking at me! 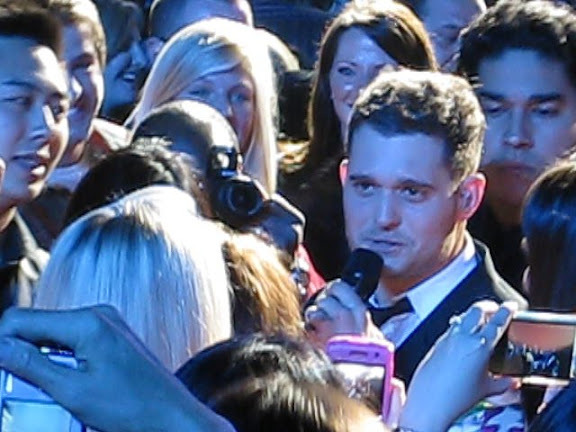 I'm so jealous, I LOVE Michael Buble. I've got to get my hands on some tickets here pretty soon. We have tickets for his show out here in June. I CAN NOT WAIT!!! So jealous of your trip to NYC, I totally want to go! you look so skinny - and blonde!